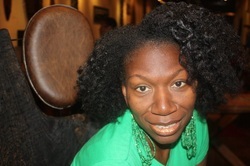 Jamila Crawford, owner of Bazaar Noir, is an acclaimed chef with over 15 years experience. Her career has been inspired by a wide variety of culinary interests including Latin-American, Asian, and Caribbean, Indian, African and more. Clients include: Erykah Badu, Dave Chappelle, Caron Wheeler, Andre 3000, and Saul Williams. Earthcandy Gourmet Vegan Cuisine is available to cater your next event or your next personal meal. Nyemay Aya,Creator of Bazaar Noir, The Veggie Taste and Owner of Nyemay's Collectables is bringing cultured couture and home decor to a fresh market. With her notarized embroidered bath and hand towels, hooded jackets AND the addition of aprons, pillow cases, placemats and crotched scarves & baby blankets, this spirited collection is poised for prominence.